Metallica has launched its own brand of brew, and it’s not surprising that Enter Night Pilsner Beer will be packaged in Metal Cans! Enter Night Pilsner Beer is a new collaboration between Metallica and Arrogant Consortia, a subsidiary of Stone Brewing Company in Escondido, California. As the thirstiest of Metallica fans can tell you, It’s not the first time the band has ventured into the adult beverage market. In 2018 Metallica released their own whiskey appropriately titled Blackened. 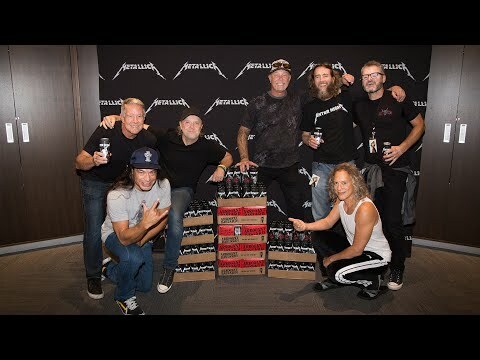 Enter Night Pilsner has been available since September in concert venues during the Metallica’s recent tour dates, and also in a few tiny outlets. The beer will be available internationally this spring. Founded by Greg Koch and Steve Wagner in 1996, San Diego-based Stone Brewing Co. is the 9th largest craft brewer in the United States. “I remember seeing Metallica on the cover of a magazine just after the Black Album was released,” recalls Greg Koch. “On the cover was a quote that resonated with me to this day: ‘Metallica didn’t go to number one, number one came to them.’ I loved what that meant. Exclusive: Dave Mustaine Tried To Electrocute Me!